The Bidegain family has deep, deep roots in the agricultural area around Sutter Buttes, the remarkable geologic formation in California’s Central Valley. Bidegain Farm primarily raises field crops, such as alfalfa for horse feed. John manages the farming, and Julie handles the sale of the hay. “Hay work makes for long days from March to November. Since the work day ends when there’s no more daylight or no more work to do, it’s hard to predict, so we have dinner at noon.” The farmers who come to pick up their hay know Julie is a great cook, and they’ve figured out when to arrive to get invited to dinner. Julie and John both love to cook. There are a lot of Basque in the area. Everyone has their own chorizo recipe, and they have a chorizo contest every year. John and Chad have won many times. “They are very opinionated about food,” Julie laughs. The Bidegain family was often enlisted to cook for functions at their kids’ Catholic school. To tackle barbecuing for 500 people, the couple devised a carousel shaped barbecue unit that used indirect heat. It worked so well, they built and sold the units to other people. 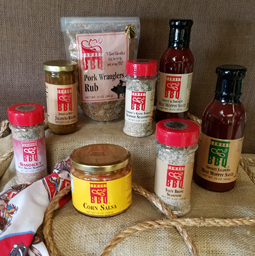 “Those barbecue buyers would ask, ‘Do you have a barbecue sauce?’ and I would say I was working on it!” Julie says. 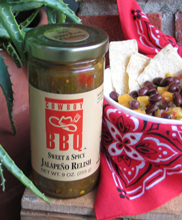 In 2002 Julie started selling her barbecue sauce in local gourmet stores. From the beginning the demand has been strong, and every store that she visited both bought the sauce and reordered it. Her expansion into relishes came about because someone brought her some marinated jalapeño peppers from Texas. Julie had always made bread and butter pickles, and she combined the two to make her Sweet & Spicy Jalapeño Relish.